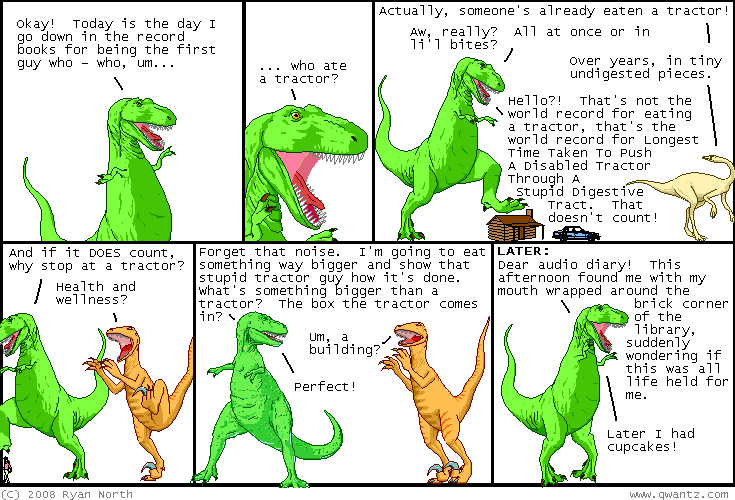 Dinosaur Comics - November 24th, 2008 - awesome fun times! November 24th, 2008: Thanks to everyone who emailed me the Mega Man 3 cheat that kinda has a two-player mode, only not really? It will be as close as we get. CHRISTMAS: It is the time of year where I have to remind you about Christmas. But I have an excuse! Here in online land it takes some time to ship things to you and yours, so if you want totally awesome Dinosaur Comics clothing to arrive in time for Christmas, you have to order soon. If you're shipping to a non-American or Canadian address, you should order by November 30th (ie: very soon!) to get Christmas delivery, and if you're shipping to a US or Canadian address, you don't want to push things past December 14th. One year ago today: just the first three panels of this comic = your christmas card this year? ?